It's hard to compare music with similar line-ups, and the recently reviewed "Wild Chamber Trio", with Gianni Mimmo, Clementine Gasser and Elisabeth Harnik is clearly not unique in its genre. Today, we review two other albums with the same trio line-up : sax, piano, cello. It is improvised chamber music. You can call it jazz too, but it may fit into other categories as well, or even better, outside pigeonholing. They have one thing common, though, and that is their mastership of instrument and sound. 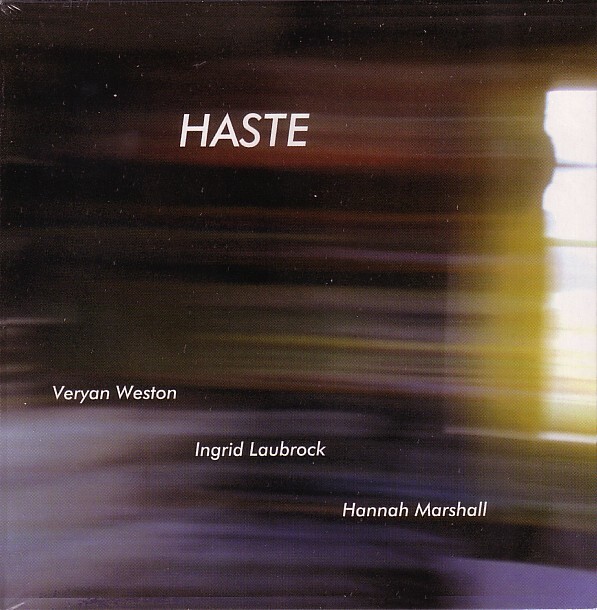 The trio here is Ingrid Laubrock on tenor and soprano, Veryan Weston on piano and Hannah Marshall on cello. The journey they have in store for us is called "Haste", yet it starts with the kind of pace as if they have all time in the world to move forward, and that's a good thing. Notes are stretched around a tonal center, with the three musicians circling around with full intensity, alternating subtle low volume moments with harsher bouts of dense interaction. The overall effect is eery, presenting a sonic universe full of surprises and possibilities, of sensitive enthusiasm and hesitating joy, and at times of sad acceptance or paralysing terror. Possibly one of the most discerning aspects of the music is its restraint, the cautious control over sound, creating rather minimalist moments of few notes, yet with full dramatic effect. It is hard to follow what is taking place conceptually, yet the listening experience is a great one, with all three musicians playing better and more aligned than in many of their recent albums. Weston is of course a mainstay of British improvised music, but the way he challenges - and is challenged by - these two young musicians is fantastic. Both Marshall and Laubrock have been in great demand for collaboration lately and we can only hope to hear even more of them. Beautiful, challenging and rewarding music. I saw this trio play last year with only me and one other person being part of the paying audience. To the credit of the trio, they played the entire session. It's great to hear them here again on record. Gianni Mimmo is on soprano saxophone, Hannah Marshall on cello and Nicola Guazzaloca on piano. Mimmo's playing is actually setting the color of the music : his usual abstract lyricism determines the overall sound. Sometimes hard to relate to, sometimes beautiful, always inventive. This is music that requires attention and close listening in order to get into it. The break-neck speed interaction between the three musicians is exceptional, as if programmed, although oftentimes this forces your brain (or is it only mine?) to be too conscious of what is taking place instead of just going with the flow, being sucked into the music's sonic universe. 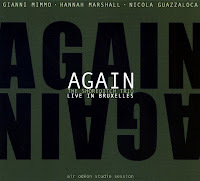 Luckily, that happens not too often, and when the band really starts exploring new sonic environments, it becomes more compelling, with Mimmo creating multiphonics out of his instrument, while Marshall and Guazzaloca add drama, depth and tension. The big difference with "Haste", is that this trio uses the entire range of their instruments from very low to very high, often in big intervallic jumps, whereas the other album reviewed girates around a more anchored central tone. This is music that is built around paradoxes, of intimacy and distance, of natural evokations and cerebral concepts, of spontaneous lyricism without resorting to patterns, fragile and solid at the same time, sad and joyful. 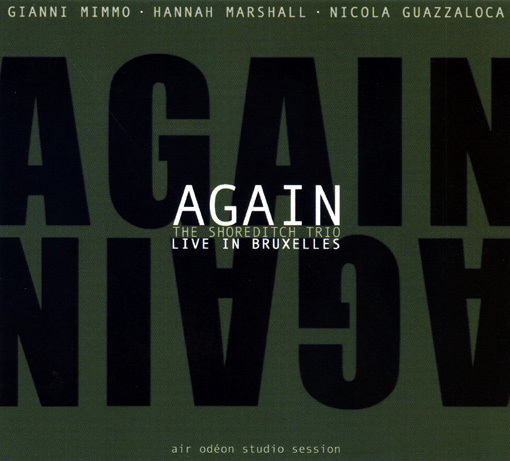 It is hard to grasp, and that makes you want to listen to it, again, one more time, again, as its title suggests.